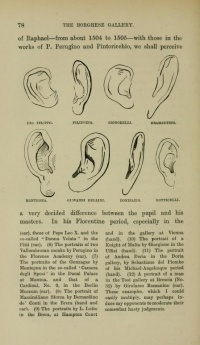 Ears is an illustration from Italian Painters by Giovanni Morelli. It depicts typical ears for Fra Filippo, Filippino, Signorelli, Bramantino, Mantegna, Giovanni Bellini, Bonifazio, Botticelli. Unless indicated otherwise, the text in this article is either based on Wikipedia article "Ears from "Italian Painters"" or another language Wikipedia page thereof used under the terms of the GNU Free Documentation License; or on original research by Jahsonic and friends. See Art and Popular Culture's copyright notice. This page was last modified 17:05, 11 March 2014.